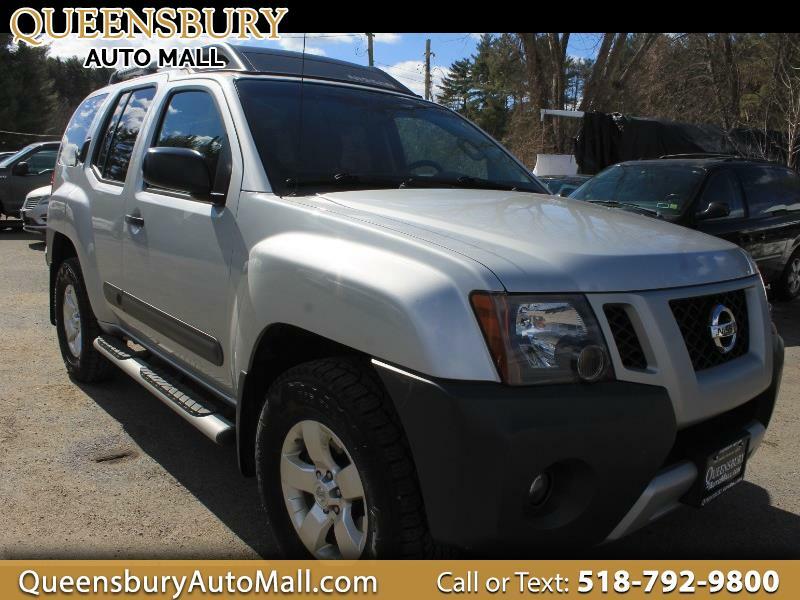 ***RARE ADVENTURE FRIENDLY RIDE - HERE'S AN ABSOLUTELY GORGEOUS FOUR WHEEL DRIVE TAX TIME SPECIAL AT QUEENSBURY AUTO MALL - COME TO 635 GLEN STREET IN QUEENSBURY, NY 12804 TO GET A STERLING SILVER 2013 NISSAN XTERRA S 4WD SUV WITH ONLY 49K MILES - TRADE YOUR OLD RIDE INTO THE AUTO MALL AND SAVE MORE $$$ - DON'T MISS THIS STUNNING, RARE, LOW MILED NISSAN XTERRA 4WD SUV*** 4.0L V6 DOHC 24V MOTOR! CLEAN CARFAX HISTORY REPORT! FOUR WHEEL DRIVE WITH LOCKING TRANSFER CASE! LUGGAGE RACK! TOW PACKAGE WITH TRAILER HITCH RECEIVER, AND OVER DRIVE HAUL MODE! FOG LAMPS! FIXED RUNNING BOARDS! FULL CABIN HEATING AND AIR CONDITIONING! REAR WINDOW DEFROSTER AND REAR WINDOW WIPERS! FULL POWER EQUIPMENT! FULL CABIN SAFETY AIRBAGS AND SIDE AIRBAGS! REAR CARGO UNDER HATCH! FIRST AIDE KIT WITH HOLDER! KEYLESS ENTRY SYSTEM AND KEYLESS REMOTE STARTER SYSTEM! DUAL GLOVE BOX STORAGE WITH OPEN FACE STORAGE! FULL CABIN HEATING AND AIR CONDITIONING! AM/FM/CD PLAYER WITH AUXILIARY INPUT JACK, USB IPHONE INTEGRATION, AND SATELLITE RADIO! TOUCH LED HOME SCREEN WITH REAR VISION BACKUP CAMERA! TILT/TELESCOPE STEERING WHEEL WITH CRUISE CONTROLS! SPLIT FOLD REAR SEATS! ALLOY WHEELS ON FRESH TIRES!